It is built at the area of Varia, a suburb of Mytilene. It was built in 1964 with a donation made to the municipality of Mytilene by Stratis Eleftheriadis -Teriade, the man who made Theophilos and his painting famous. It includes 86 works painted by the Lesvian folk artist Theophilos Chatzimichael, also donated by Teriade to the Municipality of Mytilene. Theophilos - a self-taught painter - is the most significant representative of Greek folk painting in the 20th century. He was born in 1868 and died in 1934. He spent his childhood in Varia, a beautiful place that he virtually adored, a feeling that is evident in his painting. Being restless by nature and a dreamer he traveled - from Smyrna to Pelion and Larissa painting along the way. These were the first two periods of his painting. He returned to the island after its liberation in 1912 to complete a third period, his last one. It is there that Teriade met him and decided to promote his work, which he did organizing exhibitions both in Greece and abroad and succeeding in making Theophilos internationally recognized. Theophilos has left us a plethora of paintings - among them wall paintings decorating houses and shops in Lesvos and Pelion. His themes - historical and romantic - express two elements central in his own nature: a touching patriotism and a tender romantic tendency. A third source of inspiration is nature and idyllic scenes presented in a typically Greek setting are characteristic of his work. His art has all the characteristics of genuine folk creation: vivid colors (often prepared by himself with natural materials), authenticity, spontaneity and sincerity of feeling combined with a disregard for either historical truth or detail. The works displayed in the museum belong to the mature period of his painting and are known for the harmony of colour, the realistic intent in the portrayal of persons, their vividness and spontaneity. The Museum gives quite representative a picture of the artist’s work. 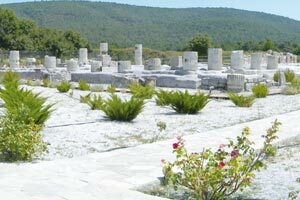 It is very near the Theophilos Museum, at the suburb of Mytilene, Varia. Stratis Eleftheriadis-Teriade (1897-1983) was born in Mytilene, but while still quite young he left for Paris to study Law. Soon his interest in painting makes him look deeper into art and he becomes an art critic. He worked with editors in the publication of arts books and magazines. 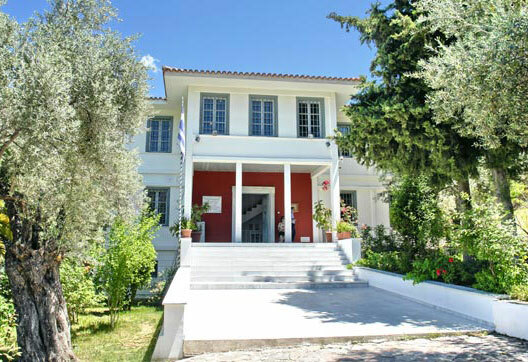 After the Museum of Theophilos he also donated to the Municipality of Mytilene in 1964 this museum. In the showcases of the museum the visitor can admire the bound volumes of the “Grand Books” ( original works of art issued in a limited number of 180-200 copies, signed by the artist), while most of their pages hang open on the walls. The pages on the walls are the proofs used before the final printing of each Book. Through these pages that also include poetry, the visitor can “watch” the creative effort as it unfolds and so take part in the dialogue between painting and poetry. That was the aim of Teriade and from this point of view the Museum itself could be called an “Open Book”. In the Museum 37 works made by Theophilos (used in the exhibitions Teriade organized for the folk painter), six by Tsarouchis and three by Kaliyannis - both distinguished Greek painters - are also exhibited. It is a wonderful - from an architectural point of view - mansion, built in 1912, in the eclectic style near the southern port. Inside the central building statuettes, ceramics and jewels belonging to the Prehistoric-Roman times are exhibited. At a secondary building inside the yard, heavy archaeological finds are exhibited including among others the unique Aeolian capitals from Klopedi’s ancient temples, the most significant of the inscriptions found, tombstones, reliefs, statues and coins from the Archaic to the Roman years. The Museum also has the following collections: finds from the excavations made by the K’ Ephorate of Prehistoric and Classical Antiquities in all of Lesvos, finds from the excavation that took place at the cave of Ayios Vartholomeus and exhibits that have been donated to the Museum by private individuals: Simantiri, Grimani, Alatza, Lagou, Binou collections and others. It is housed in a modern building near the old one of the Archaeological Museum. Its construction was finished in 1995. 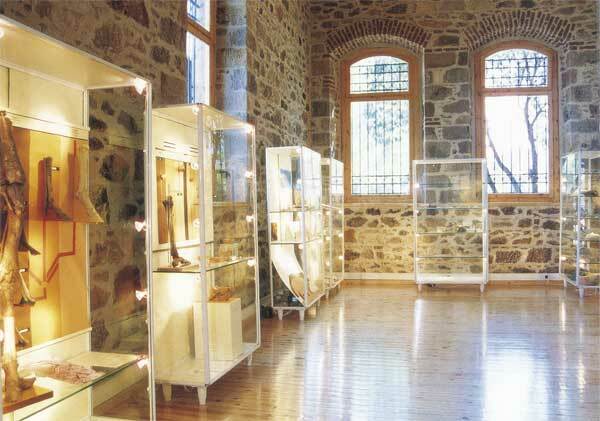 It houses a permanent exhibition on “Lesvos from the Hellenistic to Roman Times”, which opened in 1999 and aims at giving the visitor a picture of the life-style in Lesvos from the 2nd century BC to the 3rd century AD. The exhibition presents villas with artistic mosaic floors, sculptures and items of daily use. The exhibition is accompanied with explanatory texts, maps and models that contribute to the better understanding of the exhibits. 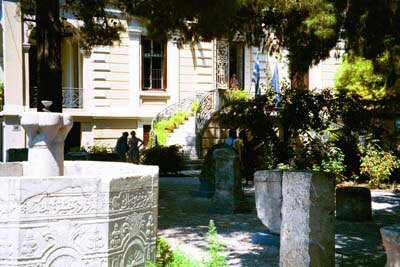 The Museum includes: Hellenistic-Roman sculptures (artistically sculptured tombstones, statues and busts) as well as mosaic floors and frescoes from the luxurious villas brought to light by the excavations at the hill of Ayia Kyriaki - evidence of the significant economic development of the island in the Hellenistic period. Vrissa is at the southern part of Lesvos, 51 km away from Mytilene. In the beautiful the village, the history of which goes far back in ancient times there is the very interesting Natural History Collection which includes paleontologic finds, discovered in clay deposits in and around lakes and streams. The finds include fossilized parts of rare land and sea animals and fossilized flora with an average age of two million years. The most important animal fossils discovered are: the jawbone and other parts of the skeleton of two proboscides - ancestors of today’s elephant - and in various locations fossilized horse bones of various sizes, bones and jawbones of the carnivorous Nyctereutes megamastoides - a relative of today’s nyctereutes- bones of giraffes, deer, antelopes, gazelles, bovines and bones of tortoises (one of the most impressive finds are the bones of a giant tortoise 2.5 m. long). However the most amazing among the finds is an extremely rare family of giant apes, belonging to the species of Paradolipithecus, the earliest representative of the species in Europe. The discovery of the above finds resulted in the creation of the Natural History Collection, which is housed for the time being in the building of Vrissa’s view of the Aegean Sea. 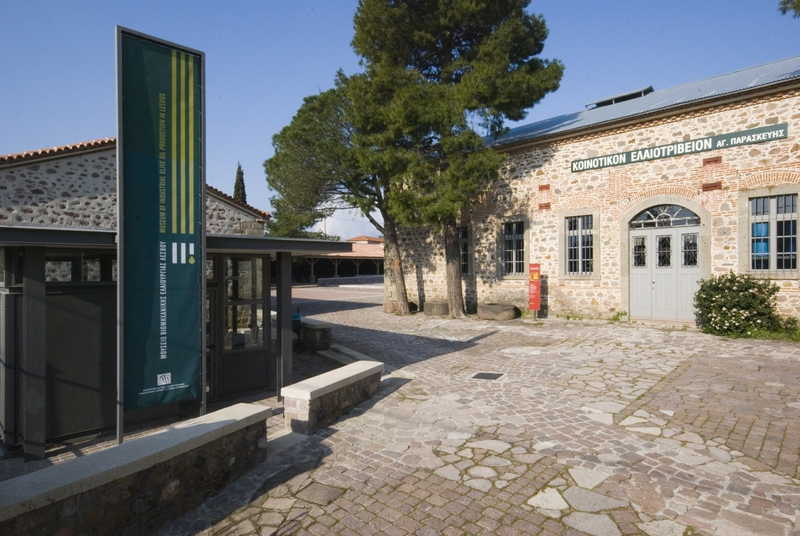 The Museum of Industrial Olive Oil Production in Lesvos (MBEL) in Agia Paraskevi, on the Island of Lesvos, has been founded and designed by the Piraeus Bank Group Cultural Foundation (PIOP), which is also responsible for its operation. 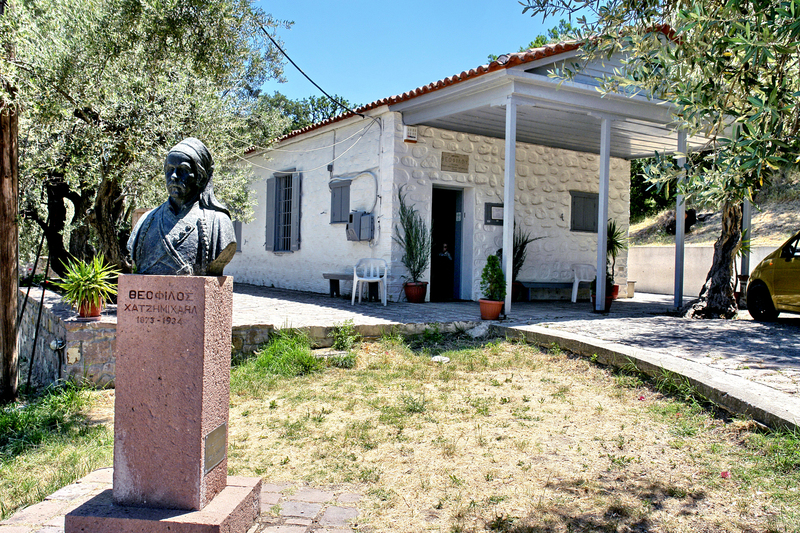 It is housed in the premises of the old communal oil-mill –the Municipality of Agia Paraskevi having ceded their right of use to the Foundation. The Agia Paraskevi complex has been developed as “an oil-mill turned into a museum of an oil-mill”, restoring both its architectural and mechanical features to their original condition. The old machinery and equipment that have been preserved, and fully restored, are being exhibited in a unique way by being put into use for demonstration’s sake, which is supported by digital shows. One can witness the development of the various machines, while special emphasis is given to the changes the introduction of mechanical power brought into the process of oil production. In the main building the three basic steps of the oil production process (crushing the olives, pressing the olive-pulp, separating oil from water) are shown, while reference is made to the auxiliary operation of the flour-mill. The former storage areas of the olive crop are used as auxiliary exhibition halls, in which exhibits present the human element involved in oil production. The larger storage areas hold detailed exhibits of: a) the history of the communal oil-mill of Agia Paraskevi, noting especially the communal ownership of the mill –a quite novel development for the time, and its effects on the social and economic structure of the area; b) the mechanization of oil production in Lesvos; and c) the wider socio-economic background. In the smaller storage areas the full cycle of trades involved in oil production is presented. In the beach “suburb” of Plomari, Agios Isidoros, you will visit the ouzo-distillery of Barbagiannis. The distillery has a museum section and a production section. 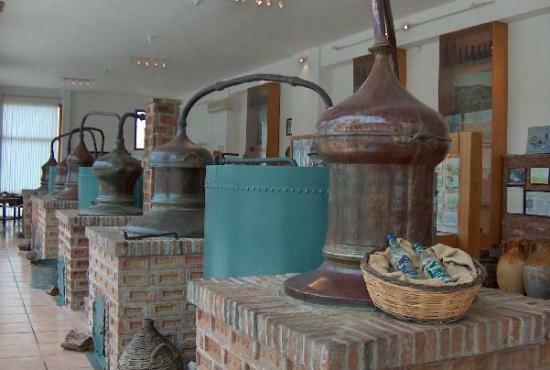 You will visit both sections of the distillery and experience the methods of “creating” real ouzo, now and then. You will also have the chance to taste the Barbagiannis ouzo, probably the best ouzo in the world. 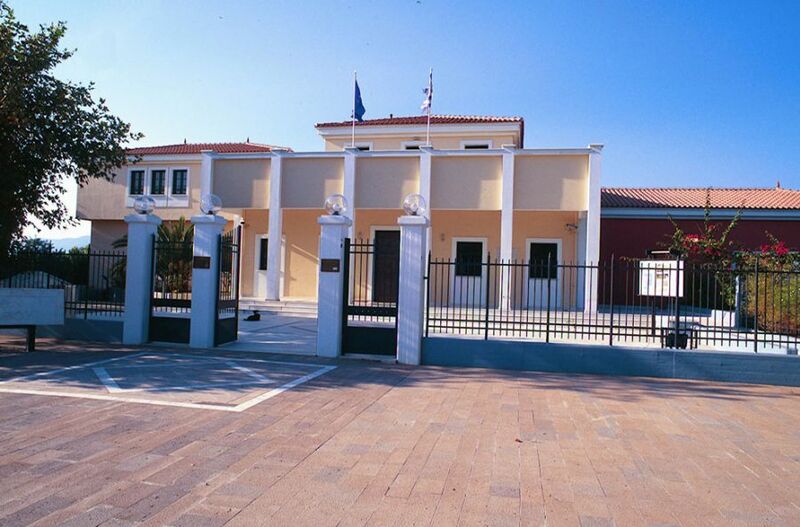 The Digital Museum "George Iacovidis," in Chydira of Lesbos, the birthplace of the painter, is the first fully Digital Museum of Art in Greece. Formed under special museological study and based on new technologies, shows the highlighs of the life and work of the renowned Greek painter through a variety of electronic and digital projection systems interacting. The works presented in the museum are all digital reproductions. Through thematic units, using various tricks like the magnifier, the isolation of the data table data during its analysis, the comparison with other works or Iacovidis himself or his teachers and the combination of narrative and graphics, Digital Museum "alive" projects making them more familiar to the visitor. The creation of the Digital Museum "George Iacovidis," it is an initiative of the Educational and Cultural Foundation "NG Papadimitriou." The aim is to act as a meeting place of the Art Technology offering visitors of all ages, an artistic experience for enjoyment and knowledge. The archeological sites at Agia Paraskevi are especially important, since the ancient inhabitants of the island worshipped many Gods in large sanctuaries at this area, fragments of which have been found. The temple of ''Mesa'', dedicated to Zeus, Dionysus and Hera, was the center of ancient worship and communication of those people. In the early 4th century BC, it was the seat of the League of cities of the island. The site contains many architectural fragments from the temple. In early Christian times, a funerary basilica was built on top of the temple, which was later supplanted by a post-Byzantine church. An enormous quantity of relics, ruins, altars and remains still exist in the area, testifying to the religious life of the people who came here to worship at the great temple of Pyrra. Legend also has it that the Apostle Paul came here in 52 AD to preach Christianity to the inhabitants of the island. It is at a distance of 600m. from the village of Moria (6 km from Mytilene ). 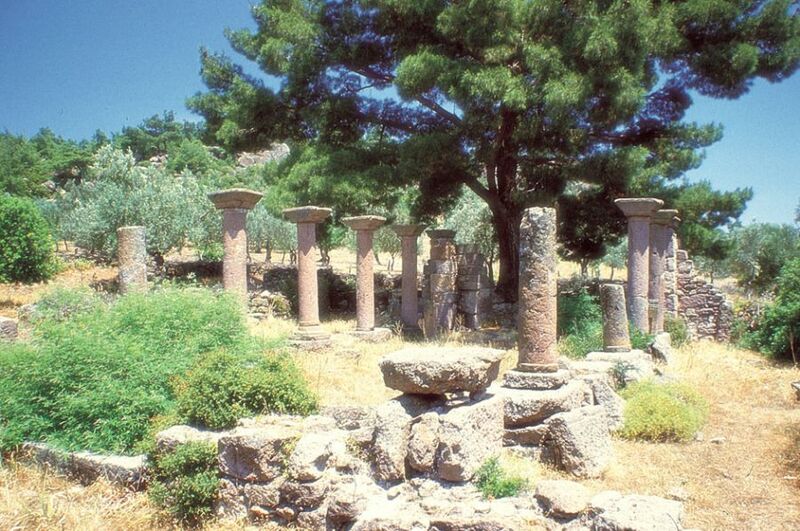 It is a stone construction built during the Roman era (2nd century AD), that supplied water to Mytilene from the springs of the Ayiassos area. Today it is under restoration and the visitor can admire a part of it, the so-called “Kamares” (arches): twelve columns standing erect holding seven arches curved in gray marble from a neighboring quarry. At the top of the construction stood the water pipe. The water came from the lake Megali Limni (Mt Olympus), and along its 22km route it collected water from other springs too. 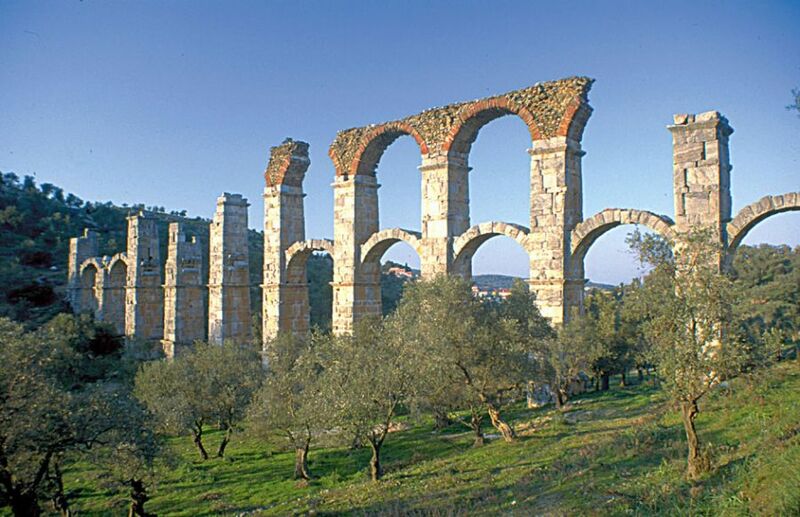 Other parts of the aqueduct have been found at gorges in central Lesvos. At the area of Moria, the Aqueduct was 170 meters long, 27 meters high and had 17 arches. The remains of this Early-Christian basilica can be found along the main road that connects Ag. Paraskevi with Komi and Pigi. It is believed that this church constituted the nave of a small monastery and dates in the second half of the 6th century A.D. The monument was excavated and restored by A. Orlandos in 1937. It is built on top of a pine-clad hill, near the port. It is one of the largest castles in the Mediterranean. Its construction started in around 483-565 AD and was completed during the years of the rule of the Genoese family of Gatelouzi (1355-1462). Ancient materials were used in the building. In 1373 small towers were built inside the castle by Francisco A’ Gatelouzo. In 1384, an earthquake destroyed it and it had to be reconstructed. Later it was fortified with new ramparts, dikes and cannons. 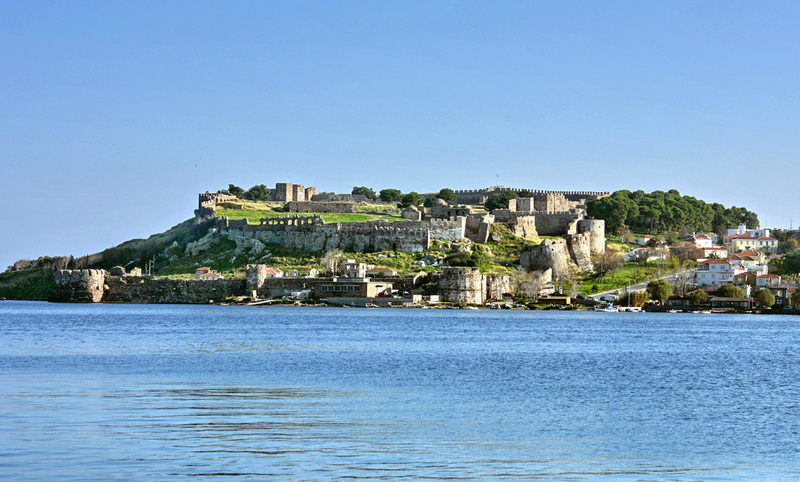 The Turks took control of the Castle in 1462. The palace of the Gatelouzi still stands, a square stone tower with an inlaid slab. The shapes on the slab show the coat of arms of the Gatelouzi and scenes from Roman duels. On the outer gate of the Castle, there is the coat of arms of the Paleologi. During the years of Ottoman rule, a seminary was built - the building is still preserved today - and other works took place. Under the castle there is a system of tunnels, which offered shelter to women and children during war and a cistern (capacity 4,000 m3). Today the castle is used for cultural events. It was built in the Byzantine era on the ruins of ancient walls, as a defence against raids made by Franks and Turks. It was completed in 1373 by the Genoese Fransisco Gatelouzo. Later the Ottomans extended the fortifications. It is very well built from red and brown trachyte rock, with strong walls and inlaid slabs carrying inscriptions, coats of arms and other marks. The space is divided in several levels. The main gate is made of heavy wood and is covered with metal slabs. 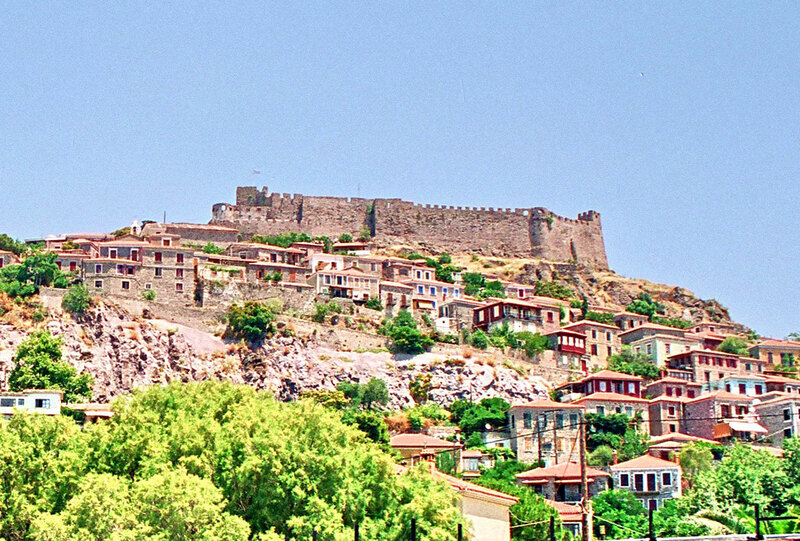 The castle stands on the top of a pine-clad hill and is among the best preserved in the Eastern Mediterranean. Today it is used for cultural events.